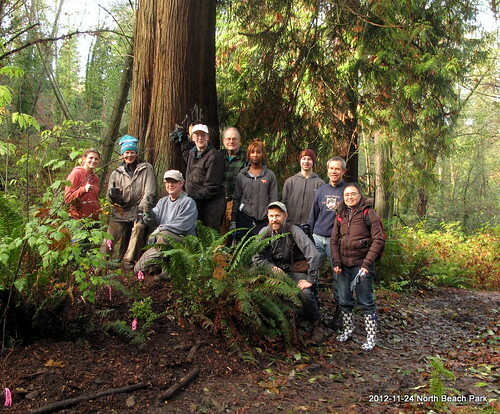 The work party at North Beach Park on the 24th was directed to planting. We had 148 plants to get into the ground, in three different locations, and in a number of microenvironments, from perennial wetland (wet all the time) to upland slopes. 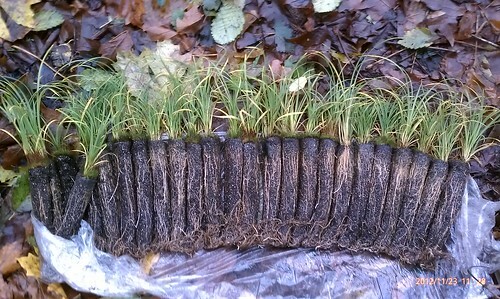 25 Slough Sedge plugs ready to go into the wetlands. 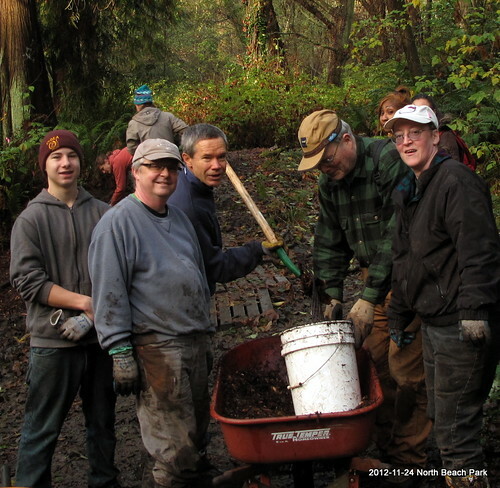 Each year, Green Seattle Partnership gives every park under its auspices 200 plants. This year, we concentrated the order on wetland plants and upland shrubs. There are a lot of seeps in the park, and although the water moves slowly most of the year, it doesn’t stop. This year, which went from record drought to record rainfall, change is noticeable on a weekly basis. Over the years, the seeps have carried away quite a bit of the park. 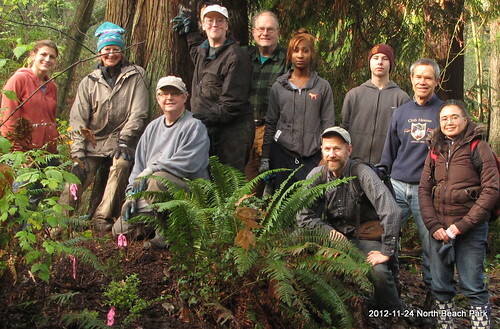 We had 12 participants at the work party, which turned out to be just enough for the work we had. I had been worried that we wouldn’t get all the plants in the ground, but in fact, we were able to wrap up and have all the tools wiped down and back in the Jobox by noon. 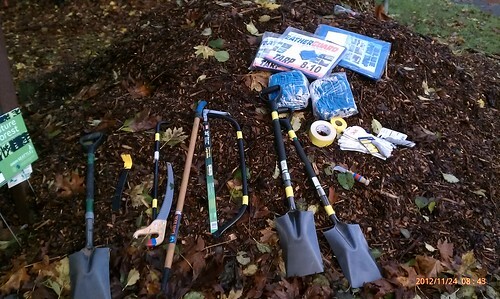 Getting the work done was vastly aided by a couple prep sessions with Drexie, tagging the plants at the Carkeek nursery, and then transporting them to the park and putting them in place to begin work. Here are a few of us late in the work party, getting mulch into a bucket. You can see I’m not shy about getting dirty. Left to right, foreground: Clint, Luke, Alan, Morrie, Julie. Left to right, background: Selena, Drexie, Sam, Genie. Photo by Tad Anderson. Left to right: Selena, Drexie, Luke, Julie, Morrie, Sam, Tad, Clint, Alan, Genie. Not pictured: Loren and David. All the pink flagging tape in the lower left corner is attached to just-planted plants. Photo by Keelan Currin. Thank you to everyone who participated and helped! It was great fun and very successful.